The doors of St. John’s are open to all who wish to take part in the Church’s praises and prayers, and to hear the Word preached. By Christ’s command, and in accord with the Church’s tradition, Baptism in water and in the Name of the Trinity, together with profession of Faith, is required for Salvation (Matthew 28:19, Mark 16:16; John 3:5), and for admission to membership in the Church, and to all other Sacraments. In accord with Christ’s institution, baptism is administered not only to those who profess the Christian Faith, but also to their children, with the condition that the children are taught “all things which a Christian ought to know and believe to his soul’s health” (Prayer Book, p. 277) – as set forth in the Catechism (pp. 577-583), and in the teaching of the Bible and the Prayer Book. Baptism of infants should take place sooner rather than later. It may happen during the Sunday service, or at other times, as determined by the Rector in consultation with the family. Baptism is administered to adolescents and adults who profess the Christian faith and are prepared to make the vows of Baptism, normally after instruction in them. Baptism may happen during the Sunday service, or at other times, as determined by the Rector in consultation with the candidate for baptism. If there is any serious risk to the child’s life, Baptism should be administered promptly. If a priest is not available, any person who intends what the Church intends by baptism, may perform an emergency baptism, using water, and saying “I baptize thee in the Name of the Father, and of the Son, and of the Holy Ghost”. Other prayers may be said at this time (the Lord’s Prayer), but the priest should be notified of the baptism, and the child should then be formally received into the congregation by the priest. 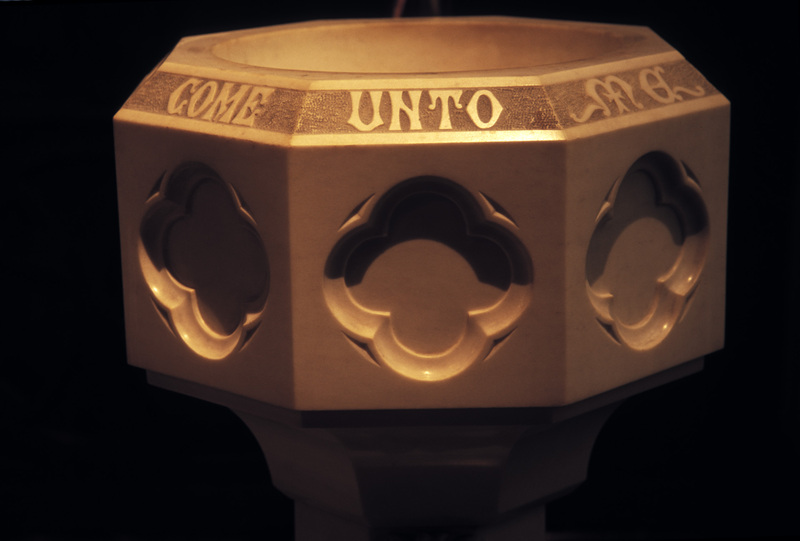 In the Anglican tradition, Confirmation (administered by a bishop in historic succession) follows Baptism, and only those who are confirmed, or ready and desirous of being confirmed, are admitted to Communion. When adolescents or adults come to St. John’s already baptized and admitted to Communion in another church with a different tradition, they may continue to receive the sacrament, but are encouraged to seek Confirmation. No one, however, may be admitted to Communion without having first received Baptism. Instruction of children for Confirmation normally takes place in the sixth grade, at the 9:30 a.m. Sunday class which begins in September and runs through to the date of Confirmation, sometime in the spring of the next year. Instruction of adults for Confirmation begins in the winter and continues until the Bishop’s visit. Baptized persons seeking to transfer membership from another church to St. John’s must supply proof of Baptism, and (if they have received it) of Confirmation by a bishop in historic succession. This may be done by a Letter of transfer or by a baptismal certificate, or other reasonable evidence. In doubtful cases, when Baptism cannot be determined, conditional re-baptism may be administered. To ask for a Letter of Transfer, please notify the Church office of the church of your prior membership. With the privileges of Baptism come obligations, set forth in the vows of Baptism – to renounce the world, the flesh, and the devil; to believe all the articles of the Christian Faith set forth in the Apostles’ Creed; and to keep God’s holy will and commandments. As members of St. John’s Church, this baptismal obligation is lived out in the practice of worship, witness, service, and stewardship. As the General Thanksgiving says, in gratitude for his grace, we are moved to “show forth his praise, not only with our lips, but in our lives, by giving up ourselves to [his] service, and walking before him in holiness and righteousness all our days” (p. 19). We expect all members of St. John’s to profess the Christian faith openly, and to seek instruction and encouragement in the Faith by taking part in public worship on Sundays and major holy days; by hearing, reading and “inwardly digesting” the Word of God in Scripture, or in other books of sound Christian teaching, or by hearing sermons, or by taking part in one of the many classes or study groups that meet on Sundays or weekdays. In the daily recitation of the Creed Christians unite themselves in “the faith once delivered to the saints” and with Christians through the ages. We expect all members not reasonably prevented to take part in public worship on all Sundays and major holy days of the Church’s year, and to receive the sacrament of the Lord’s Supper or Eucharist at least on Easter, and more frequently as they have opportunity, with repentance, faith, and charity. In addition, parishioners are strongly encouraged to take part in daily prayer according to the Prayer Book and Bible, either in the Chapel, or privately. Integral to our offering of ourselves in worship is the faithful stewardship of all the goods which God has entrusted to our use, both material and spiritual, for the promotion of God’s glory and the benefit of the Church and people of God. We expect all members to give money generously, sacrificially, and in proportion to their means (Deuteronomy 16:17). To encourage this practice, and to help the church budget and plan for good stewardship of its resources, “Estimate of Giving” cards are distributed and received in late fall. We also ask that Christians remember the Church in their will and in other forms of long-range financial planning. The counterpart of Worship is Witness – the witness we make in word and deed, “not only with our lips but in our lives” by our service of others. Because God has in Christ has loved us, we are set free from anxious self-concern, for the service of others in love. The primary locus of service is in and through the fellowship of believers in the Church, but it includes both those near to us (family, friends, employees, employers), and those who are not near – especially anyone in special need. Accordingly we expect members to build relationships with one another, to serve one another in love, to offer their time and talents in the service of the Church, and in their station in life to serve others in accordance with God’s will. We also expect members to bear witness to God by their holiness of life, in conformity to the Ten Commandments, as interpreted by the teaching and example of Christ and his saints. As flawed and fallible human beings, we will fall short in our obedience, and so the Christian life is one of continual repentance, and ever-deepening gratitude for the grace that freely forgives and restores believers. The clergy are available to provide spiritual counsel and the benefit of particular absolution, for those whose consciences are troubled in any way. Beauty of the Anglican Tradition.